MASTER PROBLEMS People and Society Can doomsday preparations guarantee your survival? 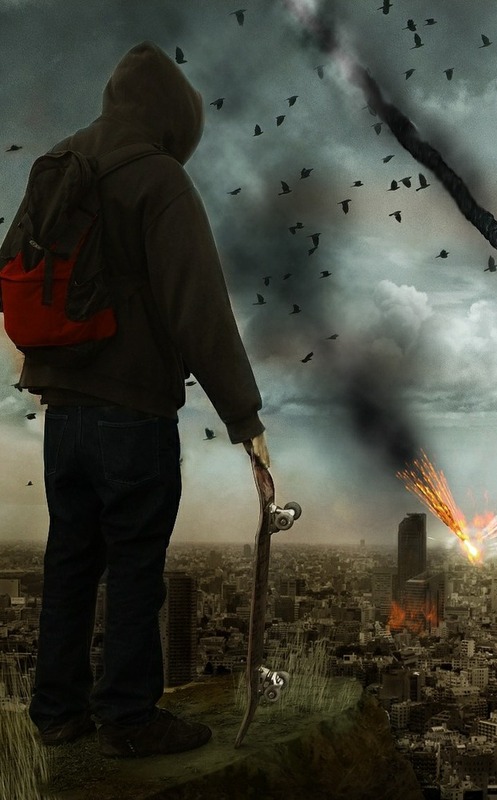 Can doomsday preparations guarantee your survival? So warned one advocate of a growing movement that both intrigues and frightens: the survivalists! They are, as their name suggests, a people bent on survival of what they feel is an inevitable global catastrophe— be it nuclear, natural, social or economic. From where disaster will come matters little to them, for they prepare for any eventuality. Periodicals such as Survive keep them up to date with the latest survival paraphernalia: rifles, freeze-dried foodstuffs, combat gear and prefabricated fallout shelters. Some survivalist sophisticates have even invested in underground condominiums so as to ride out a ‘nuclear Armageddon’ in comfort. True, for many their military maneuvers and target practice seem a macabre fantasy. Here army-fatigues-clad participants tramp through the woods shooting harmless pellet guns at one another—a rehearsal for post-disaster guerrilla warfare. Childish play? Perhaps to some. But others view such maneuvers as serious business. Many are nevertheless tempted to laugh off survivalists as charter members of the lunatic fringe, but others feel that they are not so irrational after all. The threats of nuclear war and overpopulation with resulting famine, crime, economic collapse, or even the breakdown of the social order, are not the wild imaginings of neurotics. These problems perplex and deeply disturb even the experts. Unlike those who practice “psychic shutdown,” the survivalists try to face these fears. Though they come from a variety of social and economic backgrounds, and though their movement is fragmented by different philosophies and approaches, they are united by this powerful common denominator—FEAR. They feel that the “system” has failed—that governments, police forces, courts and monetary systems are simply not equal to solving the mounting problems of this decade. They therefore choose to be self-reliant and trust that their own initiative and abilities—honed to a fine point by advance training—will save them when the disaster comes. But are fallout shelters, freeze-dried foods and caches of gold practical approaches to future survival? How effective would they be in the case of an actual nuclear war? Recent studies of large-scale nuclear war (5000- to 10,000-MT yields) have estimated that there would be 750 million immediate deaths from blast alone; a total of about 1.1 billion deaths from the combined effects of blast, fire, and radiation; and approximately an additional 1.1 billion injuries requiring medical attention"
Suppose, though, that a shelter was so fortuitously placed as to escape this immediate annihilation. Yet this grim scenario was of a mere limited nuclear war! The extinction of a large fraction of the earth’s animals, plants and microorganisms seems possible, and extinction of the human species itself cannot be excluded." The chances of survival-training paying off thus appear dim. But even granting the possibility that the scientists’ predictions are overblown, survivalism still has a fatal weakness. While nuclear war would probably end governments and armies as we now know them, it would not erase the basic cause of war. Putting one’s own selfish interests first invariably leads to strife. Are the ideologies that now bind the survivalists of such an unselfish nature that greed and selfishness would not dominate their thinking when faced with the scarcities that a global catastrophe would generate? When disaster does strike, they will (at least at first) try to practice good principles. We will share what we have to the best of our ability. But what about when supplies begin to run short? In such a climate of terror, hidden stores of food or gold might spell a survivalist’s death sentence. Survivalism is really nothing new. In fact, the survivalists are reminiscent of a group that existed in the first century of our Common Era: the Jewish Zealots. As the seventh decade drew to a close, hostility between the Jews and their oppressive Roman rulers was reaching its flash point. Religious fanaticism, natural catastrophes such as earthquakes and food shortages all fueled fears that the end of the existing system of things had come. Like the survivalists of today, some tried to fortify themselves for the future. When Roman armies under the command of General Cestius Gallus moved against Jerusalem, some Jewish Zealots managed to capture the city of Masada. In their 1,300-foot-high (400 m) rock fortress, the Zealots had a battery of weapons and an ample supply of food and water. Survival seemed secure. Roman General Titus, however, destroyed Jerusalem in 70 C.E., leaving Masada as the focal point of Roman attack. For seven long months the Zealots held out. But Roman engineers succeeded in constructing a huge ramp that granted their soldiers access to the fortress. Knowing that capture meant a miserable existence as slaves, the 960 men, women, and children of Masada committed mass suicide. Their efforts to survive by taking refuge in a heavily armed mountaintop fortress proved to be futile.